What does everyone automatically think of when they think of Halloween? CANDY! But what I have found is that the kids that hang out at our house for Halloween night prefer snacks other than candy. Of course they will dig in to their candy bags after Halloween, but for the party night that is Halloween in our neighborhood, here are some fun and easy ideas that you can try for your little ghouls & goblins!!! Could this be ANY easier??? Cut bananas in half and freeze them for 30 minutes. Insert Popsicle sticks and dip them in melted white candy melts. Add eyes & freeze until ready to serve. 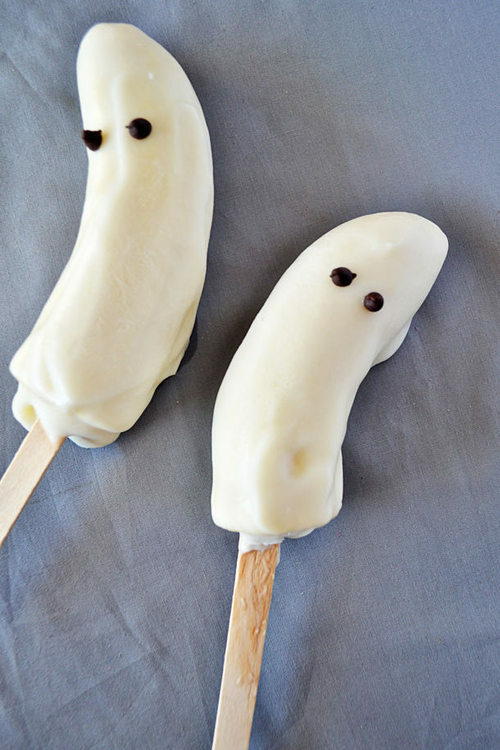 Kids love these little ghostly creations! For the fingernails, slice a green bell pepper into 3/8-inch-wide strips. Set the strips skin side down on your work surface and trim the pulp so that it’s about half as thick. 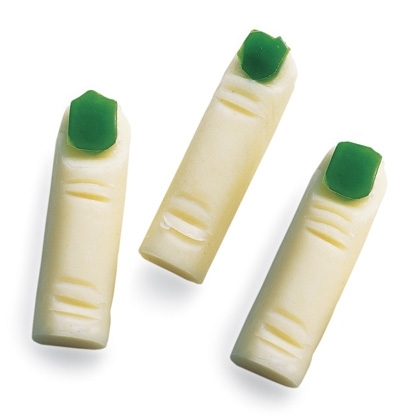 Then cut the strips into ragged-topped nail shapes and stick them in place at the ends of the fingers with dabs of cream cheese. Watch the kids (and adults) reactions when they check these out! To prepare them, just fill a serving bowl with your favorite vegetable dip. Wash and peel 4 long carrots for fingers and 1 medium carrot for a thumb. With a paring knife (a parent’s job), cut a flat, shallow notch in the tip of each carrot. Then use a dab of dip or softened cream cheese to glue a sliced-almond fingernail atop each notch. 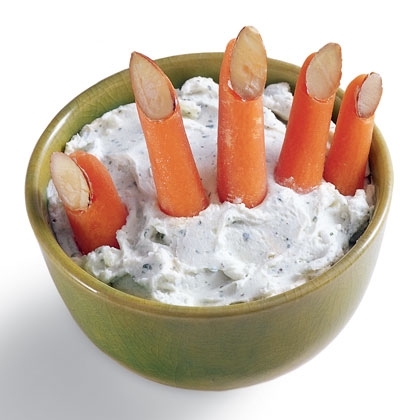 Stick the fingers in the dip, as shown, and serve with plenty of peeled baby carrots for dipping. 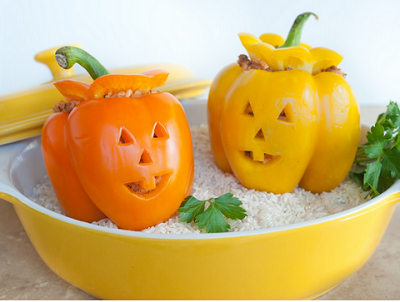 A creepy way to serve veggies and dip! 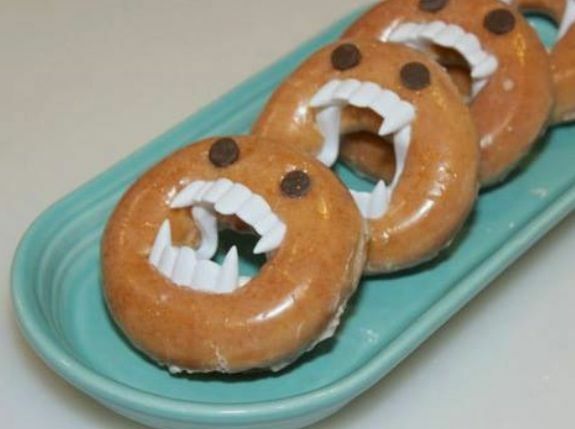 The Dracula teeth go in the center of the donut, press 2 chocolate chips point side down into the donut for the eyes. 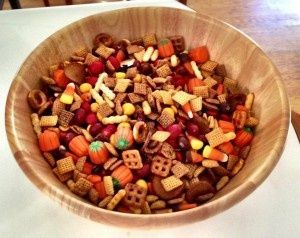 This is ALMOST as easy to make as the Halloween Snack Mix and will get a great reaction!!! Using a paring knife, cut jack-o-lantern faces into the peppers. Boil the peppers in water for 10 minutes. While the peppers are boiling, brown the hamburger meat and cook the rice (I use minute rice for the quickest preparation). Mix together the hamburger, rice, spaghetti sauce and mozzarella together and stuff in the peppers. Bake for 30 minutes in a 350 degree oven.